Budding junior artists in the Bega Valley are getting a chance to mix it with the ‘big kids’ in the 2016 Archibald Prize. Australia’s richest and most famous art competition is coming to the Bega Valley Regional Gallery through March, April and May. All Archibald finalists (except one, due to restrictions of the gallery space) will be in Bega, including the winning portrait by Louise Hearman of Barry Humphries. 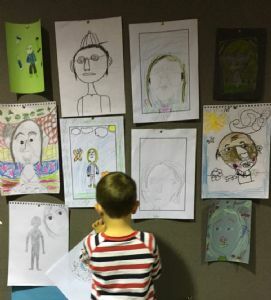 Artists aged 5 and 18 years are invited to submit a portrait for the Young Archie competition, as part of the Galleries celebration of portraiture. The portrait should be of a person who is special to you - someone who is known to you and plays a significant role in your life. The competition will be judged on merit and originality. Five finalists from each category will be exhibited at the Gallery and on the Gallery website. One winner will be chosen in each category. Each finalist and winner will receive prizes provided by ANZ. Winners will receive a $50 cash prize. Entries are open now and must be received by 4pm Friday 3 March 2017. Finalists will be announced Friday 10 March 2017. Winners will be announced on Friday 24 March 2017 at the opening of the Archibald Prize 2016 regional tour exhibition at the Bega Valley Regional Gallery. Download the entry form and Terms and Conditions from the Gallery’s website.